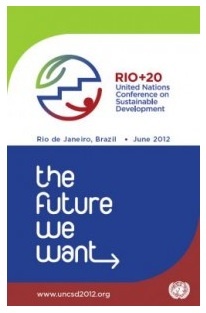 The Rio+20 Earth Summit, our Green Weenie Award winner this week, is grinding along, and has produced a draft declaration entitled “The Future We Want.” If the whole thing weren’t so insubstantial and unserious (they don’t even try any more to offer any rigorous definition of “sustainable development”), it might be worth critiquing. It has 283 numbered points in 49 stupefying pages. We reaffirm our commitment to fully implement the Rio Declaration on Environment and Development, Agenda 21, the Programme for the Further Implementation of Agenda 21, the Plan of Implementation of the World Summit on Sustainable Development (Johannesburg Declaration on Sustainable Development and the Plan of Implementation) of the World Summit on Sustainable Development, the Barbados Programme of Action and the Mauritius Strategy for Implementation. We also reaffirm our commitment to the full implementation of the Istanbul Programme of Action for Least Developed Countries (IPOA), . . .
Feel free to start giggling at any time you feel like it. . .
. . . the Almaty Programme of Action for Landlocked Developing Countries, the Political declaration on Africa’s development needs, and the New Partnership for Africa’s Development. We recall as well our commitments in the outcomes of all the major United Nations conferences and summits in the economic, social and environmental fields, including the UN Millennium Declaration and the 2005 World Summit outcome, the Monterrey Consensus and the Doha Declaration on Financing for Development, the outcome document of the High-Level Plenary Meeting of the UN General Assembly on the MDGs, the Programme of Action of the International Conference on Population and Development, the Key Actions for Further Implementation of the Programme of Action, and the Beijing Declaration and Platform for Action. I think they left out the earnest Duluth Community College Faculty Resolution on Behalf of Green Things Everywhere. I’m sure the General Assembly will correct this oversight right away. Right after they stop the killing in Syria. Wait! In fact, point 257 reads: “We request the General Assembly to consider this report and take appropriate actions.” Happy day! More resolutions from Turtle Bay.